Directions to: The Hyatt Hotel. There is limited free street parking on Sundays and a commercial parking garage near the Hyatt. Nearest Light Rail Stop: Exchange Place, Jersey City. 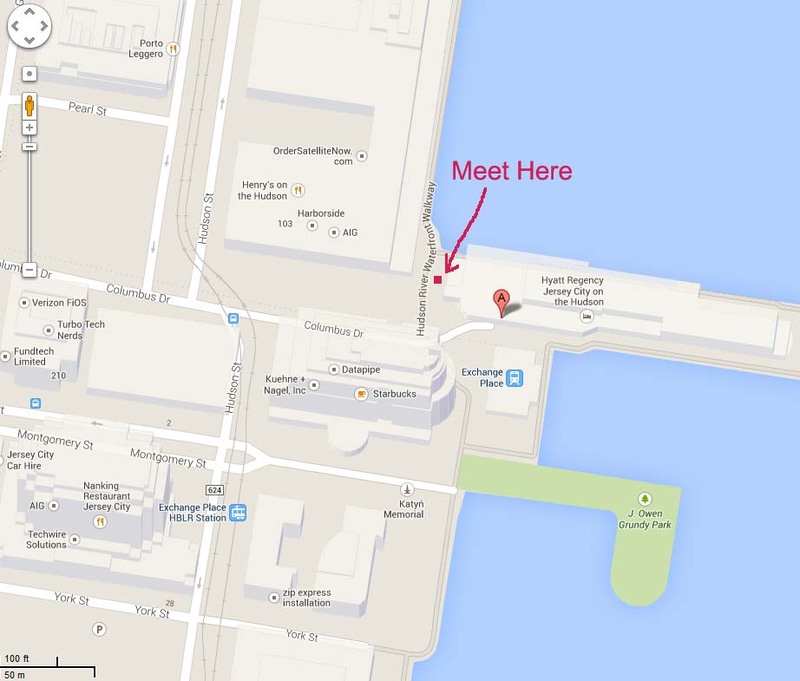 Walk one block toward the Hudson River and to the walkway in front of the Hyatt Hotel. Walk Description: The Walkway along downtown Jersey City was largely developed by major commercial builders. Walk north past The Pier, an apartment complex built over the river, the Harborside Financial Center, Avalon Apartments and the Courtyard Hotel. Pass through a gated security area of the Walkway. This area is directly over the Holland Tunnel. It is maintained by the Port Authority. The gates are only closed in case of an emergency in the tunnel. Lower Manhattan and Ground Zero are directly across the Hudson River in this area. The Crystal Towers condominiums adjoin the Walkway and, as we approach Hoboken, pass over a long bridge section of the Walkway that was recently built by the Le Frak development organization who are developing the adjacent land into condominiums. The walk ends at the Hoboken Train Station.